Bibo Sands Self Catering Resort - Barra Accommodation. Guests staying at Bibo Sands will be pampered by friendly hosts and owners, Rina and William. The smaller 1-bedroom self-catering unit sleep 2 adults and 2 children. The larger units accommodate 4 adults and 4 children. 4×4 or 2×4 Vehicle with diff lock required. ***The New Immigration Regulation dictates that as from 01 June 2015 children require UNABRIDGED BIRTH CERTIFICATES, along with their passports, when travelling outside of South Africa. Should you be travelling with/making a reservation for children, please ensure that you apply for these certificates timeously. It is your responsibility to enquiry and update your knowledge on legislation in your country. We are NOT beach front..walking distance ( 500+M..steep walking) We have sea views. Please consult your doctor about your planned holiday to Mozambique to keep safe of Malaria. Every house has its own braai (barbeque) facilities. As well as an outdoor shower. Our new swimming pool is built and ready for your enjoyment. The pool area offers relaxing hammocks and lots of shade under the cashew nut trees. Please be responsible for your own children. No direct access to beach. Guests are required to bring own beach towels (bath towels are provided). Do not forget the Peaceful Sleep or Tabard, prevention is always better than cure, so cover up after sunset! always a good idea to bring a tin opener and your favorite sharp knife. Most necessary groceries can be bought in Inhambane and closer local shops. Meat is very expensive and so is milk... so stock up on those! Fruit and Pao (local bread) are daily delivered at the Resort. Linen & bath towels provided. From Maputo, take the EN1 North to Xai Xai. Approximately 50km after Inharrime, there is a signboard on your left 'Lindela'. Take the right fork at this point to Inhambane. 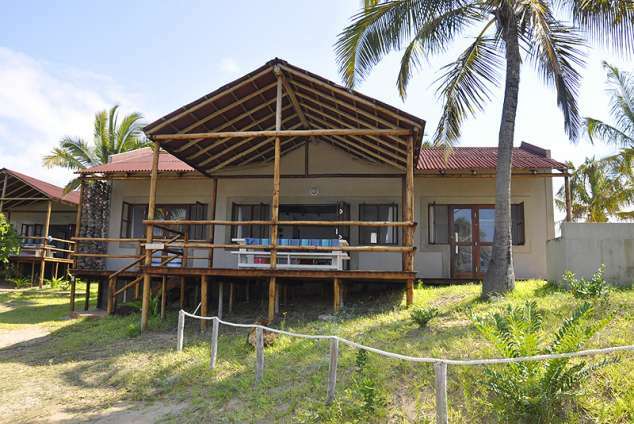 In Inhambane, drive past the hospital and turn right when you reach the harbour pier on your left. Travel through the town until you reach the stop sign. Continue to your right around the circle and follow signs to Tofo and Airport (Aeroporto). Drive past Airport keeping right. At the 'Big Tree' - (lots of signage for holiday resorts) look for signage to Manta da Barra/ Bali Hai/ light house and turn right on this sand road. this is called the light house road. Remember to let your tyres down to 1 Bar at this point. Continue on this sand road for approximately 1.5kms. Bibo Sands is situated just before Manta da Barra, turn in at same road, then left into Bibo. Your hosts will be expecting you. 3186 page views since 21 Jan, 2016.